Drivers can expect 150 horsepower and 236 pound-feet of torque from the Clean Diesel engine. A 2.0-liter inline 4-cylinder TDI Clean Diesel engine offers turbocharged power to this Golf. Choose between the standard six-speed manual or upgrade to the six-speed DSG automatic. Fuel economy is EPA-estimated at 30 city and 45 highway miles per gallon. Cargo volume sits at 22.8 cubic feet with the rear seats upright and 52.7 cubic feet with them folded flat. Standard features include 8-way power-adjustable seats, cruise control, Bluetooth, a touchscreen sound system and more. When it comes to the Golf family, the biggest difference between the Clean Diesel TDI options and gasoline-powered TSI is simply the engine. A different engine means different expectations for performance, but those who test drive the 2015 Volkswagen Golf TDI in Springfield MO don’t leave feeling disappointed. Under the hood of the Golf TDI is a 2.0-liter turbocharged 4-cylinder Clean Diesel engine, which is paired with modern emission controls to eliminate all the bad rap diesel has received in the past. The result is 150 horsepower and 236 pound-feet of torque combining to create a model that is as quiet as the TSI, surprisingly peppy and doesn’t leave a black cloud of smoke in its wake. When it comes to transmission options, Volkswagen remains true to those who prefer the manual transmission, with the six-speed stick shift coming standard for those desiring that extra sense of control and engagement while driving. The smoothly shifting six-speed dual-clutch DSG automatic doesn’t disappoint either, with Tiptronic and Sport modes that give all the thrill of driving a manual without needing to worry about properly using a clutch. Both options prove popular and pair well with the diesel engine. Interested in a 2015 Volkswagen Golf TDI? It’s true the mechanical aspects of the 2015 Volkswagen Golf TDI are what set it apart from its gasoline sibling, but the traits it shares make it an optimal choice for those seeking the impressive features of this hatchback while earning better fuel economy. The TDI earns an EPA-estimated 30 city and 45 highway mpg rating, which doesn’t quite put the 25 city and 37 highway mpg rating of the gasoline model to shame, but it’s certainly more impressive. The quality interior of the TDI impresses just like all the interiors within the Volkswagen lineup, with a more spacious cabin that what was found in previous Golf model years. The trim in the cabin is well-fitted and feels premium, with leatherette seats that are comfortable, offer good support and are power-adjustable in the front. 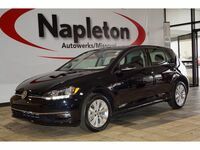 Standard features for the base model Golf TDI include Bluetooth, 16” Dover wheels, heated side mirrors with turn signals, cruise control, power windows, a 5.8” touchscreen sound system, SiriusXM with three-month subscription and Volkswagen Car-Net connected features. Find out for yourself what it feels to get behind the wheel of a diesel when you schedule a test drive of the 2015 Volkswagen Golf TDI at Napleton Volkswagen Springfield.